Motion Capture Glove using Flex sensors, accelerometer and Arduino Due. The visualization of the captured data has been done using Blender Game Engine. 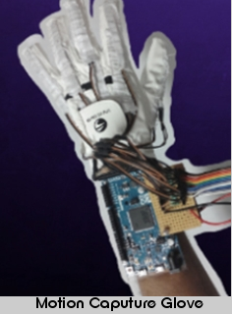 The project was done to overcome inherent difficulties in control of Humanoid mechanisms developing a motion capture glove that is capable of capturing the curvature of each finger, and the spatial motion of the palm, and to visualize the captured data graphically. Motion Capture Glove using Flex sensors, accelerometer and Arduino Due. Model of a mechanical hand to replicate the finger motions of a human hand, actuated by a servo motor was realized. SLAM(Simultaneous Localization And Mapping) is a technique used for creating a 2D or 3D map of an unknown environment. It uses a Microsoft Kinect for gaining knowledge of the surroundings and mapping is done using ROS.